Quinoa is a rather new grain to most North Americans, but it is as versatile as rice. What is so exciting about quinoa is that it has a protein content that is superior to that of most grains, because it contains all the essential amino acids. Quinoa is a very easy to cook as it cooks in just 15 minutes, and can be used in salads, soups, as a side grain dish, or even in tasty vegetable cakes as I have made in this recipe. I loved the flavor of these cakes, and I topped mine with a little fresh salsa and guacamole. My husband instead enjoyed his with a dollop of fat free Greek yogurt and a sprinkling of green onions. I was trying to keep these cakes low fat so I used very little oil to fry them, but I think if you used a little more oil they would crisp up even more than mine did. Quinoa has a protein content that is superior to that of most grains, and is high in lysine, an amino acid important for tissue growth and repair. It’s also a good source of manganese, magnesium, phosphorus and copper, and it has a high iron content. Sweet potatoes contain a wealth of orange-hued carotenoid pigments and phytonutrients. 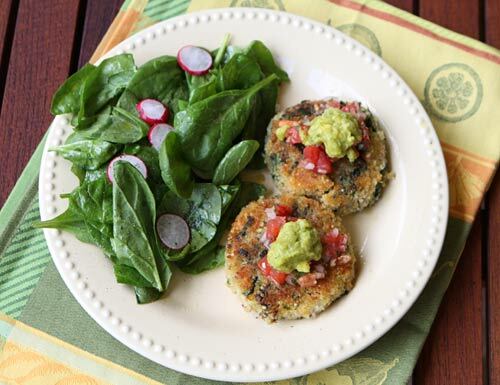 These hearty quinoa cakes include other healthy ingredients including sweet potatoes and spinach. In a frying pan, heat the oil and cook the onions until tender, then add the minced garlic. Cook the garlic just until fragrant, then add the spinach and mix well. Peel the potato, cut into 1 inch dice, and place in a bowl with the quinoa, grated cheese, egg, and smoked paprika. Add the cooled onion mixture, and season with salt and pepper. Using your hands, form 6 equal sized cakes, and carefully roll each in panko crumbs. To cook, heat the remaining 3 tablespoons of olive oil in a large frying pan over medium heat. Cook the six quinoa cakes until ctrispy and golden brown on one side, then turn and cook until golden brown on the other side as well, about 15 minutes total cooking time. Made this dip on weekend away with friends. Served iit poolside. It was so delicious and disappeared in minutes. Thanks for the great recipe!